Although I’ve never tried regular werewolf I’m confident in saying ONUW is my favorite of the bunch. It completely eliminates my biggest issue with werewolf, namely player elimination. At a yearly convention nearby they used to run a WW game one evening and although it seemed fun to take part in I never bothered because I couldn’t see a lot of enjoyment in watching people argue about who to lynch each day. Enter One Night Ultimate Werewolf. A simple little game that completely takes away the player elimination part and lasts for no more than 15 minutes. Granted, every now and then there will be a very straightforward, boring or total random game but the laughs and fun more than makes up for those. Quite simply, this is Werewolf but only one night. Several roles may perform an action during night and when a new day dawns it is time to lynch someone. After some discussions to try and determine who to kill everyone votes at the same time and the person(s) with the most votes are lynched. Werewolves (and minion) win if all werewolves survive, villagers win if at least one wolf is killed and then there is a Tanner who just wants to be killed (to win). Before starting the players need to agree on which roles to include in the game which in total will be 3 more than the number of players and it will include two werewolf role cards. Each player is given a random role and the remaining three are placed in the middle of the board. The game starts by everyone closing their eyes and following a given script each role with a night action may perform its action. The app available is highly recommended to download and use and it is also a timer for the discussion afterwards. Minion: The minion wins if wolves win, even if he dies himself. He knows who the wolves are but they do not know who he is. Mason: There are two of these and they get to see who each other are and can confirm there honesty (unless changed of course). Robber:You may switch your card with that of another player and look at your new role. Troublemaker: May switch two other players but without looking at them. This is a very powerful ability for trying to out a wolf. Drunk: The drunk has no idea who he is because he is…drunk. He must switch his card for one unseen in the middle. Insomniac: The Insomniac gets to look at his card which is the last night action so he is the only person who knows who or what he is. Villager: No ability, no action to perform. Tanner: Tough role to play as the only way you can win is if you are lynched. Try and behave like a wolf but not too obvious. Hunter: If you’re killed as the hunter whoever you point at will also be killed. In addition there is a Doppelganger who starts of the night. This one can be quite tricky as he will look at any other player card and turns into that role and performs the night action right away if it has one. This has can turn the game into utter maddening chaos, but a hilarious chaos. I love ONUW. As I mentioned, some games will be straightforward and dull but all the other games sure makes up for it. There are so many weird things that can happen which will bring out laughs for a long time. A Tanner win is always great to watch and imagine a game with Robber and Doppelganger in which the Robber has the potential to rob back his own card. One of favorite moments was seeing a 10 year old kid tricking everyone around the table to believing he was a villager and turned out to be a werewolf. His parents were probably most shocked about this event. My biggest issue is probably the space needed for a 8-10 player game as it is hard to reach across a table but having everyone stand up a couple of feet from the table may be a solution to this. I’ve never played the original Ultimate Werewolf and having played this game, I don’t think I will. A ten minute game with no player elimination and able to fit ten people around a table, all with a free app? This game is great! The game has a lot of character, especially considering that a few cards are all that make up One Night Ultimate Werewolf. It’s colorful and memorable, and goes for a humorous tone instead of horror. The cards themselves are thick and stirdy, making them easy to shuffle and pass. The game also comes with tokens to keep track of the roles you’re using each round. Add in the free app that’s incredibly well made, and you have an game made for travel. I brought this game for Thanksgiving and my whole family LOVED it. I mean it, we played this game non-stop for hours and did so for days. We set the timer for only five minutes, so you can imaging how many actual games that added up. Since the game goes up to ten players, we had plenty of room for my friends and everyone who wanted in. It was easy to teach and learn, especially with the app. There was a lot of yelling and laughing, and no one ever got mad at someone else, since the chaos keeps people from having all the information. This is a great party game with very little rules that are goning to trip new players up and should be in any gamer’s collection, casual or not. Why is it in My Collection? One Night Ultimate Werewolf is a cheap game that keeps giving and giving. It’s fun, it’s hilarious and it’s great trying to bluff without knowing your own role for certain. It makes for a great travel game and will be my go-to for parties for a long time. This is the kind of game I think I can get anyone to play and make a new favorite. I love the idea of hidden roles, but this is always more chaotic then devious. I’ve been waiting to play this for a while and I’m glad it’s as good as I heard. I’ll absolutely be buying the expansion. Highly recommened. I love games that can be played in varied groups and settings. Having a quick accessable game to bring to the table to set the tone for a game night is something I’m always looking for. When I watched the various reviews of this game and saw that large groups could play, I thought that this would be a great game for the niche I was looking for. The premise of the game is that the players are members of a quant village. Someone in their midst has become a werewolf during the night and the people of the village must conduct an investigation to eradicate the suspected werewolf. Player tiles indicating the individual roles of members of the community are shuffled and each player receives their own role to play during the game. These roles vary from common villager to seer, drunk, troublemaker, insomniac, hunter all the way up to werewolf. Three extra tiles are set facedown into the middle of the table. The game starts with players closing their eyes and listening to instructions provided by either a narrator or a clever app. This stage represents the night and is the time when the individual characters are prompted to take whatever action their specific roles are required. The werewolves are able to identify other werewolves, the seer can secretly examine player tiles, the drunk switches his role tile with another tile but isn’t permitted to see his new tile, etc. Night phase ends and players open their eyes to indicate the day phase. Day phase has players conduct their investigation by asking players about their roles and activities during the night phase. After a predetermined amount of time, the investigation phase ends and all players make their vote by pointing at who they believe the werewolves are. The game is entirely about hidden roles and bluffing. The werewolves attempt to introduce confusion and redirect blame so as not to be executed. After the conclusion of the investigation, if the werewolves have survived, they are victorious, if the villagers manage to correctly identify the werewolves, they have won the game. The only components to speak of are the thick card player tiles. The artwork on the tiles is very simple and drawn in a cartoon/caricature style which is appropriate to the game. The tiles themselves are of very thick and should stand up to wears of gameplay. This game is all about the social interaction which explains its lack of components. The game is great for what it is. As a social/party styled game with hidden roles and social deduction this game delivers. Playing time is very short and can range in time from 10 minutes to 25 minutes depending on the number of players. While this game is not deep it is excellent at delivering an enjoyable group event for players to enjoy a few laughs. The first time I took this game to one of my regular groups, we ended up playing it all day long. It’s fast, addictive and extremely social. For those who’ve played the original werewolf, the concept and roles will be immediately familiar. Each player takes one secret role in village beset by werewolves. Will you be a villager trying to figure out who the werewolves are, or a werewolf trying to avoid detection? The game is played in two phases. At the start of the game, each player is secretly dealt a role card, such as a Villager, Werewolf, or one of several specialty roles, such as the Seer who may secretly look at another player’s card or the Robber who may swap cards with another player. During the night phase, players close their eyes then open them again when their role is called to carry out their special role. Werewolves open their eyes to see see who the other werewolves are. The Masons due the same thing, but are on the villager side. The Seer and the Robber wake individually to carry out their roles, and so on. At the end of the night phase, everyone wakes up and has ten minutes to figure out who everyone else is. Adding to the complexity is the possibly that your own role may have changed during the night phase thanks to one or more players with a role which allows them top swap cards. At the end of the day phase, everyone votes simultaneously to “lynch” one player. The player with the most votes turns over their card to reveal their identity. If a werewolf gets lynched, then the villagers win, but if a villager gets lynched, then a werewolves win. A free companion app is available for Android and Apple devices to announce actions during the night and voting phases and is a highly recommended addition to the game. One Night Ultimate Werewolf is a highly social game with strong verbal reasoning, deduction and bluffing mechanics. The variety of roles with unique abilities, short rounds and player personalities give this game many hours of replayability. The game’s components are quality made, and the artwork is beautifully presented with a slightly comic style. All in all, this is a great game which you’ll love if you enjoy social gaming. First of all, The game is a short game which u need at least 3 players to play. By the end of the night some people will not be what they started as and the goal is to figure out what changed. The theme of the game is that there is a werewolf, or sometimes multiple werewolfs, in the village and you must reveal who the werewolfs are, or if you are the werewolf, you must kill off a villager. So, after everyone does the whole sleeping and waking up process, everyone talks about what happened as a way to try and figure out who each person is. After a few minutes players must all choose which player they want to die, and point at the player to signify their vote. If a villager gets the most votes the wolves win, if a wolf dies, the villagers win. This game may seem kind of weird or boring but when played with a group of friends who get whats happening, the game can be super fun. I mean we usually play it about 5 times in a row whenever it gets played because its so fun and so short. I’d recommend this game for people who like puzzle solving, lying, bluffing, being sneaky, etc… as the better you are at these the funner One Night UW will be. But be weary of CHEATERS! as the game relies on people being honest about keeping their eyes closed when their character is asleep. Werewolf, which sprang from a game called Mafia, grew out of a popular misinformation/political party game played at conventions. I’ve never played in such an environment, but during one particular massive gaming weekend, we played a version of Werewolf that we ended up enjoying. However, since the starting number of players for that version was 8, and it didn’t really get good until 12 or so, my little group doesn’t get the chance to bring it out very often. Enter One Night Ultimate Werewolf, a little game I caught wind of that promised the same kind of political fun in a 3-10 player package. Intrigued and always on the lookout for deception games, I picked it up in anticipation of our most recent gaming party. Our first play of One Night Ultimate Werewolf (henceforth 1NUW, because no way am I typing all that over and over) didn’t go very well. We used the quick start guide for five players and were left with a feeling of “that’s it?” After another round that only went slightly better, I exchanged two of the Villagers for the Minion and Insomniac, and the fun factor of the game exploded with the influx of new information. It’s important that you put the idea of “normal” Werewolf games out of your mind. As the title implies, this game takes place over one night, and at daybreak, very few players at the table will be 100% sure of their role. After cards are dealt out (the players know what cards are in the deck, and there are always three extra cards left in the center of the table), all players check which character they are, and then, at the narrator’s direction (more on that later), they close their eyes. Each role wakes up at a different time during the night by the direction of the narrator, and then performs their allotted action. Once all roles have awakened and gone back to sleep, the narrator directs everyone to wake up, and the discussion phase begins. While you know what you went to sleep as, during the night, characters like the Robber and the Troublemaker move the role cards around, and characters like the Seer and Insomniac get to look at other cards or their own, and the three face-down cards in the middle add an additional layer of uncertainty. During the day, the players use the known information to unravel the puzzle of who’s who, the villagers trying to sniff out the werewolves as the werewolves and their minions try to circumvent suspicion. At the end of the discussion period (we did 5 minutes), a countdown ensues, and at the end of the countdown, everyone points at another player at the table as their vote for execution. Team Werewolf (Werewolves and Minions) wins if no Werewolves are executed, but Team Villagers (everyone else) wins if any Werewolves are executed. If there are no werewolves, the villagers win if all villagers receive the same number of votes, ensuring no one is executed. The uncertainty about your own role after waking up is a strange feeling and takes some getting used to, but after a few plays you see that that’s part of 1NUW’s charm. No one at the table has perfect information, and you absolutely must communicate with your fellow players to try to piece together what happened during the night. Lies and chicanery abound, accented by genuine ignorance and misunderstanding. Accusations and defenses are presented under the urgency of the clock, and the final simultaneous vote means you can never be completely sure which way someone will vote until it actually happens. 1NUW creates a fantastic atmosphere of paranoia and intrigue, and though it may take a few plays to get into the spirit of the game, it’s well worth it once you do. The presentation of 1NUW is top-notch. The “cards” are thick cardboard chits with colorful, cartoony depictions of the roles. Like other iterations of Werewolf, a narrator is required, but the creators of 1NUW have kindly provided a free phone/tablet app that fulfills that role incredibly well. The app itself is no slouch, with options like male voice or female voice for narration, background noise to cover the movement of players, adjustable volume, and support for the expansion (which we did not have). That level of investment in their product is recognized and greatly appreciated. 1NUW takes a little getting used to, but once your group understands the roles and the timing and gets the idea of how to do the discussion phase, the game becomes a lot more fun. It’s a short game, a decent palate cleanser, but meaty enough that you’ll play it over and over again. If your group is at all interested in political, deception, or logical games, 1NUW is most certainly worth the investment. One Night Ultimate Werewolf really feels and plays like the larger version of the party game. It only has one round and can be played by as little as 3 players, but with the adapted characters, the trickery and rampant accusations that make Ultimate Werewolf so much fun remain intact. What makes this game stand out even more is the accompanying app that narrates the night phase for you. It’s makes for great ambiance and allows everyone to join in the mayhem. The only real issue with this game is easily fixed and that has to do with being able to hear players next to you shuffling cards during the night phase. Just tell everyone to make an effort to produce fake sounds and be aware that everyone can hear everything and you should be good. 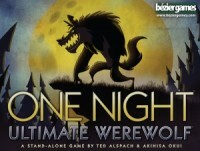 Add a Review for "One Night Ultimate Werewolf"